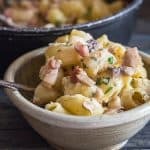 Homemade Creamy Baked Pancetta Macaroni, a fast and easy any night Family Dinner Pasta Dish. Made with sautéed mushrooms and bacon and a little cream make this Macaroni and Cheese Recipe a little different but so Yummy. Pre-heat oven to 400° (200° celsius). With 1 tablespoon of softened butter grease a medium- sized oven save pan (approximately 10-12 inch 25-30 cent). Boil water for the pasta and cook to very al dente. Drain well. In a medium-sized oven save pan (approximately 10-12 inch 25-30 cent), add 1 tablespoon of olive oil and pancetta, cook on medium heat for 2 minutes, then add the sliced mushrooms (no need to add salt because they will get salt from the pancetta drippings, add a small amount of pepper if desired). parsley** and cook on medium heat for approximately 5-10 minutes until golden, stir occasionally, making sure they don't burn. Then add the cream and heat for 2-3 minutes, add the drained pasta and gently combine. Sprinkle with Parmesan Cheese and bake for approximately 20 minutes. Serve immediately. Enjoy! **I like to add a little (1/2 teaspoon) oregano and a dash or two of hot pepper flakes instead of pepper.